Building a public statement to community, to neighborhood, and to family. The Architectural beauty in our homes is like a new melody in Spring and a warm winter coat in January. If we can imagine the world as a canvas then we have the opportunity to 'paint it' with our homes. Perhaps 'canvas and paint' seems a bit of a metaphorical stretch when building or decorating a house... Yet I believe the world is indeed a canvas and our homes reflect the inspiration of the artist in us. That said, it is indeed interesting that our homes, getaways, cabins, and businesses are designed, built, themed, and painted with the same concentration, determination, intensity, and methodology with which fine art is created. House and building design always fits into national or regional values and technology. Styles are largely a product of our values that reflect interest in a particular time and place. Building styles are as faddish as clothing styles are. As these personal styles come and go so do house styles. When they reappear they are known as "revival" styles, and are usually developed over a period of years and have attachments of the style they are developing from. Some of styles have revived two or three times throughout American history. 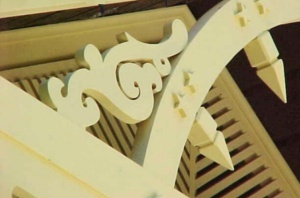 Identifying a building is typically difficult(as you can well imagine)and is usually identifiable by only one or two primary elements such as an entryway, windows, or a porch, Only the more highly crafted buildings, those designed by architects, will exhibit a wide range of the period style features. < a>Interesting, odd, and strange architecture.